Today’s champion receives £1,100,000 in prize money, while the runner-up collects £550,000. In total, the men’s singles prize fund for 2011 Wimbledon is £5,230,000, an 8.5% increase on 2010. The winner is also awarded 2000 ATP ranking points, with the runner-up receiving 1200. This is the first time the No. 1 and No. 2 seeds have met at a Grand Slam final since the 2009 Australian Open, when No. 1 Rafael Nadal defeated No. 2 Roger Federer 75 36 76(3) 36 62. In recent years, the No. 1 and No. 2 seeds have met more frequently at Wimbledon than at any of the other Grand Slam events. The top 2 seeds met every year between 2004 and 2008 (NB there was no No. 1 seed in 2009). Roger Federer, as No. 1 seed, won from 2004-07 and Nadal, as No. 2 seed, won in 2008. • NADAL is bidding to win his 11th Grand Slam title. This would put him in joint 4th place, alongside Bjorn Borg and Rod Laver, on the all-time list of Grand Slam men’s singles title holders. • If Nadal wins today he would become the second youngest man in history to win 11 Grand Slam titles after Bjorn Borg. The Spaniard will be 25 years, 30 days old on the final day of the tournament. • Nadal is looking to win his 3rd Wimbledon title to put him in joint 4th place alongside Boris Becker and John McEnroe for the most number of Wimbledon titles won in the Open Era. Pete Sampras heads the Open Era list with 7 titles. • Nadal is bidding to become just the 2nd man in the Open Era to win the Roland Garros-Wimbledon double on 3 occasions, after Bjorn Borg who completed the clay-grass Grand Slam double from 1978-80. Nadal won both Roland Garros and Wimbledon in 2008 and 2010. • Nadal is bidding to retain a Wimbledon title for the first time. In 2009, he was unable to defend his title after withdrawing from the event with a knee injury. Wimbledon champions have had more success in retaining their titles than at the other 3 Grand Slam events. 7 players have successfully defended their Wimbledon crown on a total of 17 occasions – most recently Roger Federer in 2007. • Nadal extended his current winning streak at Wimbledon to 20 matches with his semifinal victory against Andy Murray. He needed treatment for a left foot injury during his round of 16 match against Juan Martin del Potro. His 3rd round victory over Gilles Muller avenged his defeat by Muller in the 2nd round here in 2005. • Nadal is contesting his 5th Wimbledon final in 6 years. (He missed the 2009 event through injury). His last defeat at Wimbledon was to Roger Federer in the 2007 final. He has not lost before the final since 2005. This is his 7th appearance here and his 29th major overall. • Defending champion Nadal has reached his 13th Grand Slam final. He is currently in 11th place on the list of most appearances in Grand Slam finals ever. Roger Federer (23) has made the most Grand Slam final appearances of all time. • Nadal has lost just 2 Grand Slam finals, both at Wimbledon against Roger Federer. He has a 10-2 record in finals going into today’s match. • Aged 25 years 30 days Nadal has become the 2nd youngest man in the Open Era to reach 13 Grand Slam finals, almost 1 year older than Bjorn Borg (24 years 93 days). Roger Federer reached his 13th Grand Slam final at 2007 Wimbledon aged 25 years 334 days. • Nadal will lose his No. 1 ranking to today’s opponent on Monday when the new ATP World Tour rankings are released. He has held the No. 1 ranking for 57 consecutive weeks, bringing his total weeks at No. 1 to 103. • Nadal is bidding to become the 19th No.1 seed to win the title here in the Open Era. The last No. 1 seed to win the title here was Federer in 2007. • Nadal became the 5th different left-handed player to win the title at Wimbledon in the Open Era. The lefthanders to win the title here are. • Nadal warmed up for this year’s Wimbledon at Queen’s, where as No. 1 seed he fell in the quarterfinals to eventual runner-up Jo-Wilfried Tsonga 67 64 61. Last year, Nadal lost at the same stage at Queen’s before winning the title here. • Nadal has a 48-9 win-loss record on grass going into today’s match. As well as winning 2008 and 2010 Wimbledon, his career grass court highlights include reaching the Wimbledon final in 2006-07 (losing to Federer on both occasions) and winning the 2008 Queen’s title (d. Novak Djokovic). • Nadal is one of just 3 Spanish men in the Open Era to own a grass court title, but the only one to have won multiple titles on the surface. Andres Gimeno won 1972 Eastbourne and David Ferrer took the 2008 ’s-Hertogenbosch title. • At last year’s US Open, Nadal became the 7th man in history to win all 4 Grand Slam titles. He was the 3rd-youngest in history and the youngest man in the Open Era, to do so. • Nadal’s 25-match Grand Slam winning streak, which took in titles at 2010 Roland Garros, Wimbledon and the US Open, came to an end at this year’s Australian Open when he fell in the quarterfinals to countryman David Ferrer, ending his chance of completing the non-calendar year Grand Slam. • Nadal has been coached by his uncle Toni since the age of 4. • Djokovic is the 25th man to be ranked world No. 1 (since the introduction of the ATP Rankings in 1973) and is also the first man from Serbia to be ranked world No. 1. Serbia’s Ana Ivanovic (12 weeks) and Jelena Jankovic (18 weeks) have held the women’s No. 1 spot. • Djokovic has ended Roger Federer and Rafael Nadal’s reign at No. 1. Federer and Nadal have held the No. 1 spot since February 2004 – the longest period of time that 2 players have held the top spot. • Djokovic is also bidding to end Federer and Nadal’s run of victories at Wimbledon. The last man to win here other than Federer or Nadal was Lleyton Hewitt in 2002. • Djokovic is bidding to win his 3rd Grand Slam singles title. He would join the 3 other men who have won 3 Grand Slam singles titles in the Open Era: Arthur Ashe, Jan Kodes and Gustavo Kuerten. Both Ashe and Kodes won their 3rd titles at Wimbledon. Like Djokovic, Ashe had also lost 2 Wimbledon semifinals before reaching the final here on his 3rd attempt. • Djokovic is looking to become the first man since Roger Federer in 2007 to win both the Australian Open and Wimbledon titles in the same year. Federer also completed the Australian Open-Wimbledon double in 2004 and 2006. In the Open Era, only Rod Laver, Jimmy Connors, Pete Sampras and Federer have won both the Australian Open and Wimbledon titles in the same year. • 2011 Australian Open champion Djokovic has reached the final here for the first time. He is the first man from Serbia to reach the Wimbledon final – he was only the 2nd Serbian man to reach the semifinals here after Slobodan Zivojinovic in 1986. Zivojinovic represented Yugoslavia when he reached the semifinals here. • Djokovic’s previous best result here was reaching the semifinals in 2007 and 2010. In 2007, he retired at 36 61 4-1 down against Nadal with an infected blister on his toe. Last year, as No. 3 seed, he lost to Tomas Berdych 63 76 63. This is Djokovic’s 7th successive Wimbledon. • This is Djokovic’s 2nd Grand Slam final of the year, having won the Australian Open final (d. Andy Murray) and his 5th Grand Slam final overall. He has a 2-2 win-loss record in Grand Slam finals going into today’s match. • Djokovic is seeded No. 2 at this year’s Wimbledon. The No. 2 seed has won Wimbledon for the last 3 years: Nadal in 2008, Federer in 2009 and Nadal again in 2010. This is also the 8th consecutive year that the No. 2 seed is in the Wimbledon final. • Djokovic pulled out of the warm-up event at Queen’s due to fatigue. He did play one exhibition match at Stoke Park the week before Wimbledon. Only 6 different men have won the Wimbledon title without playing an official warm-up event on grass, including Federer in 2007 and 2009. Bjorn Borg won all 5 of his Wimbledon titles straight off the clay court season. • Djokovic is bidding for his first career grass court title. 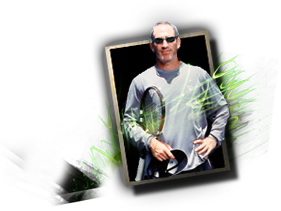 His best career grass court results are runner-up finishes at 2008 Queen’s (l. Nadal) and 2009 Halle (l. Tommy Haas). Only 2 men in the Open Era have won their first career grass court titles at Wimbledon – Michael Stich in 1991 and Andre Agassi in 1992. • Djokovic was involved in the latest-ever match finish at Wimbledon in 2010. His 1st round victory over Olivier Rochus was completed under the Centre Court roof at 22:59. The roof was closed at the end of the 3rd set. • Djokovic’s 43-match winning streak was brought to an end by Roger Federer in the semifinals at Roland Garros last month. It started at the 2010 Davis Cup by BNP Paribas Final in Belgrade, and took in titles at the 2011 Australian Open, Dubai, Indian Wells-1000, Miami-1000, Belgrade, Madrid-1000 and Rome-1000. He is in 3rd place for the longest winning streak in the Open Era. • Djokovic’s defeat to Federer at Roland Garros is his only loss so far in 2011. He has a 47-1 win-loss record this year. • Djokovic is the only male Serbian Grand Slam champion and also the only Serbian man to appear in a Grand Slam final. • Djokovic has made 27 consecutive Grand Slam appearances since making his Slam debut at the 2005 Australian Open. • Djokovic has been nominated for the Serbia team for their Davis Cup by BNP Paribas quarterfinal against Sweden in Halmstad on 8-10 July. He was instrumental in helping Serbia win their first Davis Cup title in 2010. He was undefeated in 7 singles rubbers throughout 2010. • Djokovic has been coached by Marian Vajda since June 2006. His wider team includes physios Milan Amanovic and Gebhard Phil-Gritsch.